One day, Jesus was passing by Jericho. In Jericho, there lived a short man named Zacchaeus. Zacchaeus is the chief tax collector and so he is very rich and wealthy. 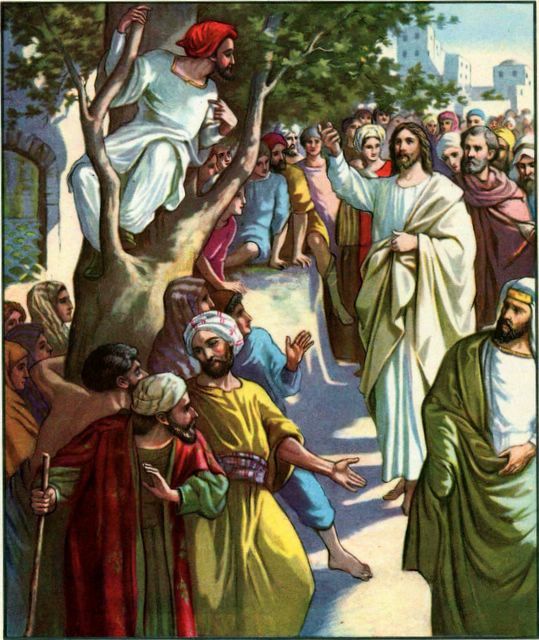 When Zacchaeus heard that Jesus is in Jericho, he wanted to see Him very much. There were so many people and Zacchaeus could not see Jesus because he was short. Everyone was taller than him and they stood in his way to see Jesus. At that moment, Zacchaeus got an idea to climb up a sycamore tree at the place where Jesus is going to pass by. So Zacchaeus hurried and ran before Jesus to the place. He climbed up the sycamore tree and he was able to see Jesus. When Zacchaeus heard what Jesus had said to him, he quickly climbed down from the tree and received Jesus into his house happily. The people saw Jesus went into Zacchaeus’ house to spend the night and they complained.